Professor Bloom (Yale; author of Blake's Apocalypse, 1963, and Yeats, 1970) interprets modern poetic history -- the history of poetry in a Cartesian climate -- in terms of Freud's "family romance," and advances creative anxiety as its motive principle. 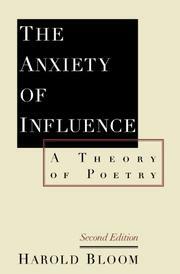 The poet's anxiety in the face of a strong predecessor is, in other words, an extreme version of the son's dubious regard for the father; and influence, far from a benign legacy of images and ideas, is a threat of death, smothering his desire and locking his rightful present up in the past. Bloom's emblem for it is the Covering Cherub of Blake and Ezekiel, while the prototype of the poet is Milton's Satan who rises to proclaim a good of his own -- only after hitting the floor of the abyss. Each poet must create himself in a kind of damned antithesis to the parent poet and, turning from the language of revelation toward a more phenomenological analysis, Bloom identifies six phases in the process -- beginning with a misreading of the forerunner, proceeding through the "revisionary ratios" of self-assertion, and ending in an embrace that is both surrender and appropriation. All this is put forth in support of an "antithetical practical criticism" which Bloom proposes as a corrective to the "tautological" and "reductive" methods now in use. The meaning of a poem, he suggests, is neither itself nor something outside poetry, but a precursor's poem. While he perhaps carries the idea a bit far, its advantages are self-evident in regard to such contemporaries as Ashbery and Ammons. Yet we are not entirely convinced by the author's insistence that his "interests are those of the practical critic"; there is a brooding, obsessive brilliance in the scholarship, in the convening of Blakean third parties (Sphinx, Muse, Tharmas), that indicates a combat of Bloom's own with the Cherub. Imposing, daemonic and -- it seems so incidental -- written with a mighty adversative flair.